Happy New Year! My Mom once told me how you spend January 1st sets you up for the rest of the year. If you start it healthy, your year will be healthy. If you are happy and productive on January 1st, the rest of the year will be happy and productive. So we in Beetstown are starting out the New Year with a healthy recipe for Cashew Vegan French Toast. I am not usually a resolution person on New Year’s, but this year is different. I have set some goals for the year, but then I am also going to set myself up for mini challenges throughout the year. I am starting by joining my friend Lindsay from Pinch of Yum on a sugar free January. She has set up the month with meal plans, checklists, and recipes for anyone who wants to cut out refined sugar. And I’m in. I have my meals planned out for the week- I am sticking very closely to her plan, though I am adding a few of my own recipes in. One of which is this French toast. So I will be having this twice this week, in between her insanely delicious avocado toast and soft scrambled egg recipes for breakfast. Every time we go out for breakfast, Mr. Beet is fairly predictable. French toast. He always orders French toast. 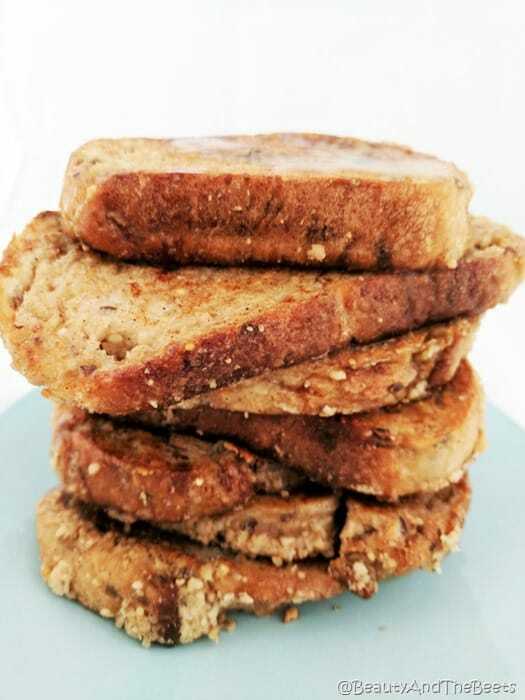 So this Cashew Vegan French Toast is healthy, crunchy and nutty. Yes, crunchy and nutty. Sounds intriguing no? Pour the mixture into a shallow dish, large enough to allow for the dipping of the bread. Dip both sides of the bread slices into the mixture, then place on a single layer in a shallow baking dish. Pour any remaining cashew mixture over the bread and place in the fridge for 30 minutes. Spray each side of the bread slices with coconut oil spray and to the skillet and cook each side 4-5 minutes, until both sides are golden brown. Keep the French toast warm either in the oven at 250° or on a plate covered in aluminum foil. Continue the process until all the bread has been cooked. 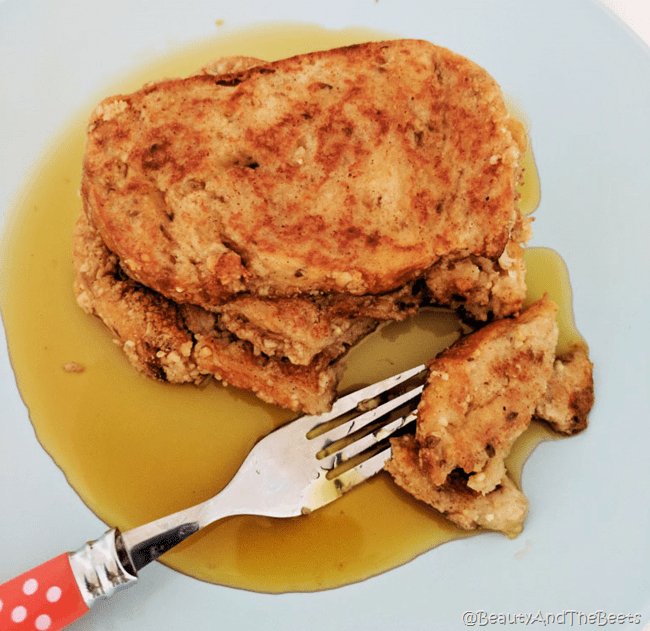 Drizzle the French toast with the maple syrup just before serving. Great idea to avoid as much sugar as possible. This is a great recipe.